Home / Articles / Pet Health / Case Studies / Roxy and Bobby, two German Shepherds who live together and are best friends. 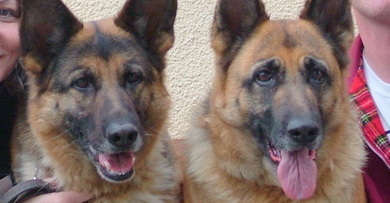 Roxy and Bobby, two German Shepherds who live together and are best friends. Many people are not aware of their animals’ social needs, and there are thousands of lonely pets across Ireland, living bored lives in isolation. In particular, there are dogs barking in back yards, rabbits going quietly mad in small hutches, and budgies twittering to themselves, alone in their cages. You only need to look to these animals’ wild cousins to see how wrong it is to keep them alone. Dogs in groups have busy and complicated communities. Rabbits have a complex social life which was well described in a humanized way in the “Watership Down” books. And budgies live in large flocks in Australia, flying noisily around as groups. 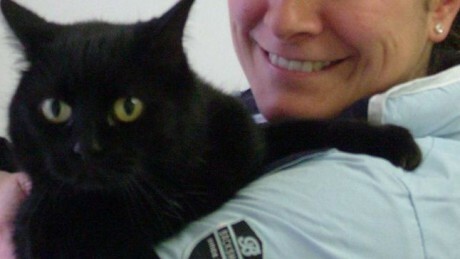 Of course, there are many instances where animals can still be kept as solo individuals. We humans provide social interaction with our pets, and if we are there to give plenty of attention to our animals, then the need for a companion of the same species is lessened. But we should still pay attention to our animals’ social and psychological needs in the same way as we look after their physical care. Many people know this instinctively, and Lynda and Mick are a good example. They have always loved German Shepherd dogs. They used to have a fine strong dog called Marley, and they bought Bobby as a puppy to keep her company. Bobby became close to Marley, and three years later, when the older dog passed away, poor Bobby began to pine. She had a complete personality change, becoming quiet and withdrawn. It was obvious that she felt lost and alone without her friend. The owners decided that something had to be done, and so they bought another puppy, Roxy. Bobby took to the new arrival at once, brightening up almost immediately, and reverting to her old, lively character. Since then, Bobby and Roxy have become the closest of companions. They spend most of their time together, and if they are not beside each other, they are very aware of where the other dog has gone. In the beginning, they did have one “argument”. Lynda had put the dogs’ feeding bowls right beside each other, and Roxy, as a puppy, was not aware of the importance of keeping to one’s own dish. She reached over to take a tasty morsel out of Bobby’s bowl, and the older dog snapped angrily at her. From that point, Lynda has been careful to feed the dogs several yards apart, and since then, there has never been any sort of disagreement. Lynda and Mick both spend time at work during the day, so the two dogs are left at home. They have learned to play games together, and the O’Donnells find it amusing to watch. Two games in particular illustrate the enjoyment that the dogs get from each other. Bobby has a soft ball, which is nicknamed her “dodie”, like a child’s soother. She holds it in her mouth nearly all of the time, like a human toddler. In one game, Roxy sneaks up on the older dog, and grabs the ‘dodie’ out of her mouth. She rushes off to hide it, and Bobby runs after her, to try to get it back. Roxy’s favourite trick is to push it with her muzzle under a kitchen unit. Bobby cannot reach it in there, and so she goes up to the O’Donnells, nudging them to ask them to get the dodie out for her. Bobby enjoys this game so much that she sometimes deliberately urges Roxy to hide the ball, putting it down in front of her, while she looks the other way. Bobby plays another game, with a larger football. She picks up the ball in the garden, and brings it up to the back door. When the door is opened, she hurls the ball into the kitchen by swinging her head, like a doggy discus thrower. This sends a clear message to the O’Donnells that she wants them to throw the ball down the garden. When they do this, the two dogs race each other to grab it and bring it back to be thrown again. Bobby and Roxy do not play together all of the time – they also have “time out” from each other, resting or playing with a ball on their own. But they are continually aware of each other, and if there is any event, such as a visitor, the two of them immediately muster up each other for support in dealing with the situation. Two dogs do not always get on well together. I have seen situations where dogs just do not like each other, and serious fights can take place, needing veterinary attention. The only answer has been to rehome one of the animals. Everyone needs to make their own judgement when choosing the right answer for their own pet. But at the very least, do pay attention to your pets’ social lives. A good friendship can transform the life of a lonely dog. 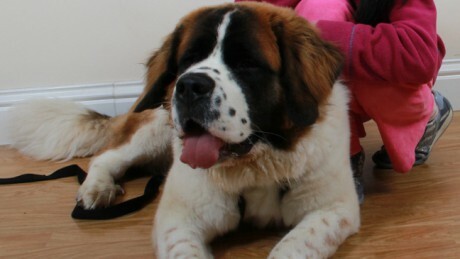 Honey, a ten month old St Bernard. 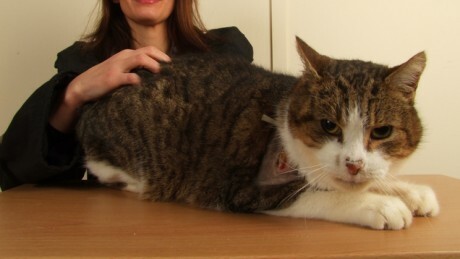 Sasha, an 8 year old cat who develops a rash in the Autumn. Taz, a ten year old male neutered cat who developed a limp.